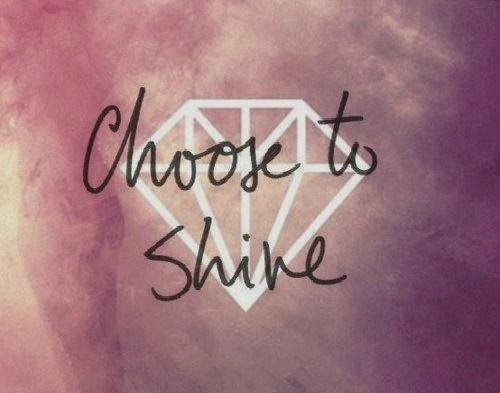 So, I choosed to shine, remember that my favourite quote is: "laugh as much as you breathe", well I have a lot of favourite quotes but all of them resemble happiness, I am a positive person and I think that quotes help me to remain in that mode. This quote is now on my list, is a fav, I promiss you that every day I'll post a quote, special for me. Is useless to make now a list, plus that in this way I will keep you in touch (hope so). Deci, am ales sa stralucesc, amintiti-va ca citatul meu preferat este: "razi pe cat de mult respiri", ei bine am o multime de alte citate favorite, toate referindu-se la fericire, sunt o fire pozitiva si gandesc ca citatele ma ajuta sa-mi mentin aceasta stare. Acest citat este acum pe lista mea, este un fav, promit ca in fiecare zi voi posta un citat, special pentru mine. Este inutil sa fac acum o lista, pluc ca in felul asta va fac sa ramaneti cititori constanti (sau cel putin sper).